The bass guitar is one of the usual, unique and essential instruments that played generally in a full band. As its name implies, it brings out the bass or the very low tone in the musical arrangement. It provides for the low notes to help smoothen the pulse and rhythm and of the band, reconciling the high notes of the specific rhythm. If you search over the internet, you will get thousands of choices for bass guitars and it is a really daunting task to select one that best in all category and at the same time suits your pocket too. Many of them are not up to the mark and you need to be very careful and need to know more about the product before buying it. 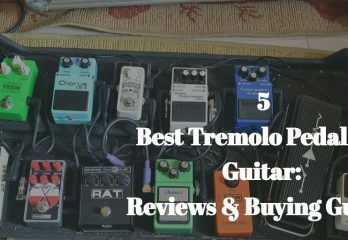 Consider this day your lucky day since in this section, I’ll be talking about some of the best bass guitars there are out there you can get for your money. 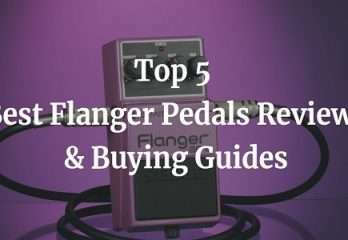 In addition to this, I’ll be taking you through the buyer’s guide after which you’ll know exactly what to look for while looking for the best guitar. Without further ado, let’s start by having a look at some of the key things you ought to consider before you make your purchase. To save you the hassle of having to read throughout the article, here are 3 of our best choices that you should definitely check out. 1 What Should You Look for in a Bass Guitar? 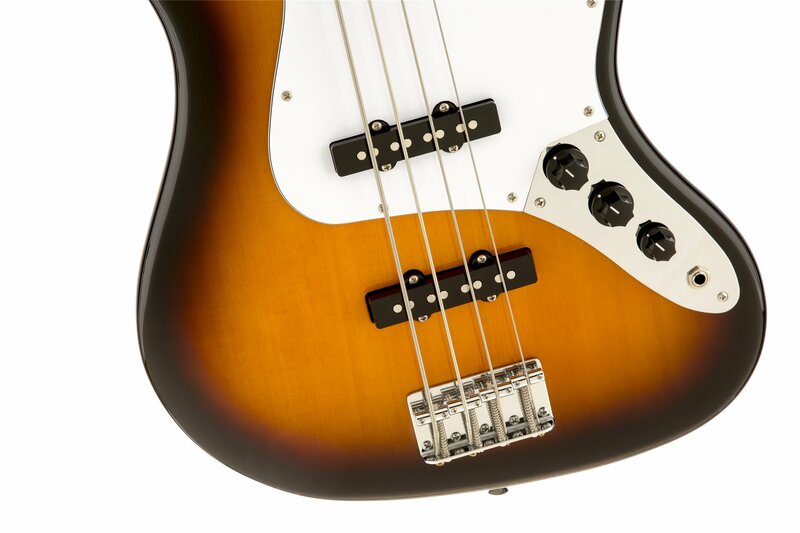 4 How Should You Choose a Bass Guitar? 5 Buyers Guide: How to Buy a Bass Guitar? What Should You Look for in a Bass Guitar? The bass guitars will have either 4, 5 or 6 strings. Though it may be tempting to go for the guitar with 6 strings, going for the 4-stringed is good for a new player. A bass guitar is a type of stringed instrument that plays a lower tone and sounds more impressive than a regular guitar. The most notable difference is that a bass guitar may have as few as four strings and they are much thicker. The thicker strings are what give the bass its low tone. The best quality bass guitar has got a bridge with more mass since this holds and supports the strings better and transfer more vibrations from the string to the body. There are normally 3 different types of bridges: the through bridge, the string-through, and the bridge tailpiece combination. The through-bridge has its strings moving via the back of the guitar’s bridge and over the saddles. On a bridge and tailpiece combination, the strings are fed via a separate tailpiece unconnected to the saddle. The string-through, on the other hand, feeds each string via the body and over the saddles. Before buying one, you can go for a little research online to know the right product as per your equipment and budget. 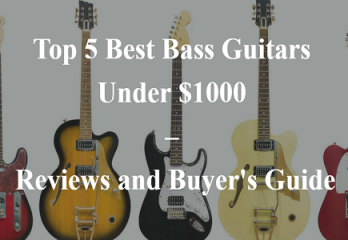 Here we have collected 5 top rated bass guitars under $500 by researching the market value and you will get the complete review of those products. Let's have a look. If you are looking for a guitar with the best constructions, design and value of using it, you can go with some branded products surely. The Squier by Fender Affinity Jazz comes with one of the best hardware you could get from a guitar which not only gives it a good feel but you also get the chance to use it for quite some time. It comes with a polyurethane c shape neck and bridge to pick up volume controls. With the two of these, working hand in hand, you’ll end up with enjoying a decent sound quality. Whether you need it for a studio recording or a performance, this is just the right guitar for you. It has 20 frets for the convenience of the players. Fender's Bass Guitar is right at the top of the market, thanks to its robust, buzz-free sound and excellent playability. It features a classic light wood finish that looks great and a graphite-reinforced neck. 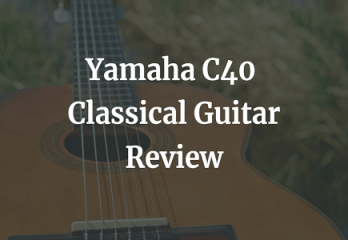 It also comes with responsive, lightweight tuning pegs that won't slide out of tune easily, as well as a real high-quality bridge that doesn't buzz. The master tone control feature can give you more control over the sound quality; this is definitely the ideal beginner guitar. Comes with two single-coil pickups which are just what you need if you want a variety of classic and contemporary tones. It comes with a proud heritage and a decent price and that makes it the right choice for the beginners. You should also consider having a rosewood fingerboard. This product comes with the perfect combination of rosewood fingerboard and maple neck and the combination tends to produce a warm and spacious sound. It has single ply pick guard also. Equipped with a comfortable neck and high-quality hardware. Two single-coil pick-ups to get a variety of classic and contemporary tones. Q: Does the headstock have a gloss finish on it? Q: is it right handed? 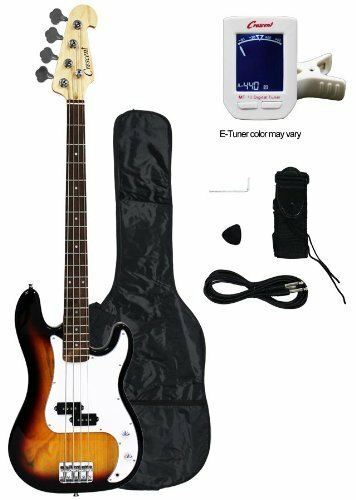 It comes with 4 strings that make it the ideal choice for anyone who is trying out the bass guitar for the first time. The 4 strings mean that the guitar will have a narrower body hence convenient for younger guitarists with smaller hands. The E-A-D-G format is also easy to master and play. The body is quite lightweight which gives you the comfortable feel as you use it with minimal fatigue. Maple neck of the guitar gives you the guarantee that you’ll be getting both a bright and clear sound each time you play the guitar. The fretboard is constructed with rosewood that promotes a warm and spacious sound. With both the maple and rosewood combination, you surely will get the best sound quality. This is one of the best bass guitars under 500 dollars. Comes with 4 strings and perfect for any new learner. The body is mahogany-made and quite durable. If you are looking for anything else rather than a starter bass, this is not it. Q: is it a full scale or a short scale? Q: would this be a good starter for rock music? Q: what gauge string does it come with? Looking for the best bass guitar under 500? Well, the Squier by Fender Vintage might just what you need. This right-handed guitar comes with a solid-wood body construction, which contributes to the durability and sound quality that you’ll be getting from it. When it comes to the comfort, the narrow body construction makes this the best bass guitar for those with small hands. The guitar is also very lightweight and comfortable to use while eliminates fatigue. As far as you are choosing your first bass guitar, the Squier by Fender Vintage will perform as you expect. It comes with 4 strings much easier to play and master the E-A-D-G format. The offset waist maple body gives the guitar a bright and clear sound, which makes this one of the best guitars you can use especially in a studio setting. It comes with the single-coil pickup. With the single-coil, you get only one coil and one magnet that end up giving you a bright as well as a focused sound. Just like many bass guitars in the market today, this one is a specially designed right-handed guitar. If you’re left-handed, you may try another one. This guitar is made to give you a classic feel of the music and a Jazz bass. Single-coil picks up for a more focused sound. Has got 4 strings hence ideal for any first-time user. Comes with a solid-wood body construction hence more durable. Q: what is the action of the bass? Q: does it ship outside the USA? Q: will it come with a carry bag? This guitar comes with a lot of outstanding features and probably more than you can expect to find on a bass guitar that sells for less than $500. Without further ado, let's narrow down on the features. First of all, it comes with 20 medium jumbo frets. Since the best bass quality can be found in the lower fret numbers, 20 will definitely give you what you seek. It comes with the single coil pickup lines; you get to have a focused as well as a bright sound. Though there will be a little bit of noise as is the case when it comes to the single-line pickups. As for the construction, the guitar comes with 4 strings which mean that it will be narrower hence you can easily be able to play it, especially if you have got smaller hands. It comes with a maple C-shaped neck as well as the rosewood fingerboard. The maple neck will give you both definition and clarity when playing your bass notes. As for the rosewood fretboard, it will give you distinction when it comes to the tones. 20 medium jumbo frets for a good bass quality. Single-coil pick-ups hence you get a more focused sound. 4 strings make it comfortable to hold and easy to use. Q: does it come with a carry case? Q: how are the frets on the guitar? Q: is this an active or passive guitar? A: the guitar is passive. The guitar gives you a vintage tone that is delivered by the 3 custom Jaguar single-coil pickups with notched claw shielding rings. Single coils have been around for long and are quite simple. They give you a bright and focused sound. 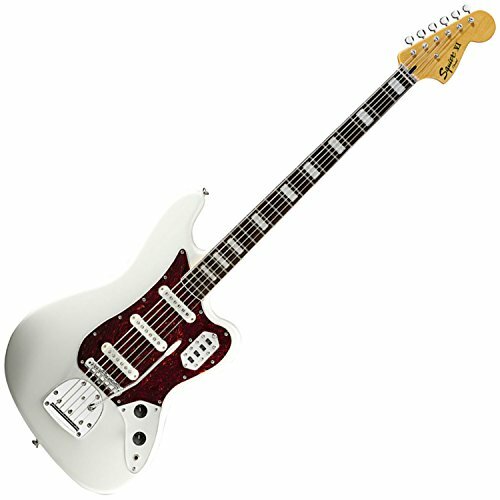 This is truly a unique bass guitar that known as baritone guitar too. You will surely fall in love with the music of the guitar that provided with gritty and low tone sound. It has updated its baritone classics also. It has 6 strings on but this makes the instrument quite complicated for a beginner, it is ideal for the advanced guitarists. The 6-string count allows you to step up your skills and have a better sound output. It also comes with the 21 medium jumbo frets. This gives you the bass you desire since most bass notes lie in the low fret counts. The modern C-neck style is comfortable to use and the 9.5” fingerboard radius makes things easier for you as well- you’ll definitely enjoy the way this guitar feels. The fact that it comes with a lot of tonal variations via the (4) two-position slider switches allows you to play in a variety of styles. It surely is the best bass guitar under 500 dollars. With the 21 medium jumbo frets, you get a good quality bass. Considering it’s a 6-stringed guitar, there’s room for better experience. Q: does it come with a hard case? Q: is this bass or a guitar? Q: are the necks the original dimensions of 7.0 as the 1961? Here we find out 5 of the best bass guitars under 200 dollars, and we wrote their reviews here. You have to read these before purchasing the best one for you. 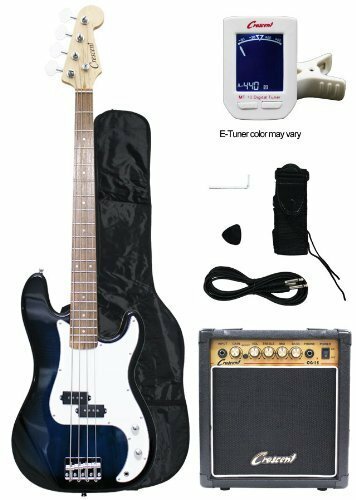 As per the construction, design and the price, this guitar can serve both a beginner bass guitarist as well as advanced guitarists. It is completely a handmade guitar that means you’ll get a lot from of it and at the same time need to spend less money, that just makes it the best bass guitar under 200 dollars. Here’s what you’ll be getting from it. It comes with 4 strings. According to the experienced guitarist the E-A-D-G format is easiest to master hence if you’re just learning how to play the bass guitar, this can be the perfect one to start with. Durability is an obvious added advantage on this guitar considering that it is 100% handmade. Get to use it for as long as possible. It surely is designed to take a good place in the industry. 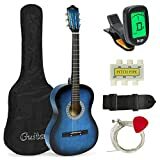 It comes with a starter amp, an amp cable, a gig back which can also act as a protective case, extra strings, a shoulder strap and the CrescentTM digital E-tuner. 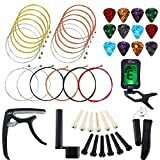 Comes with a lot of accessories for a starter bass guitarist. Has got 4 strings hence comfortable to hold and easy to use. Q: how many watts does the amp have? Q: what strings will I need to restring this guitar? Q: what is the size of the neck? A: it’s a full size neck. This guitar has got a maple C-shape neck with a 9.5-inch radius and 20 medium jumbo frets. Most bass playing occurs in the lower fret positions that make 20 frets ideal for bass playing. The single coil feature is quite simple to use and it will create both a bright and focused sound quality. 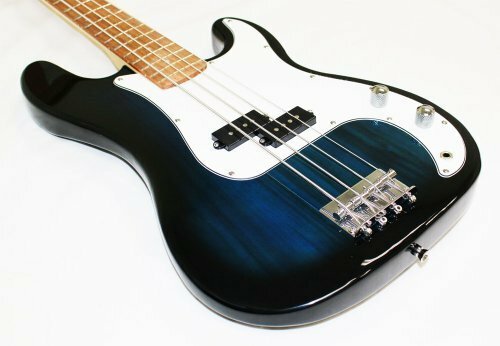 If you are looking for a bass guitar that plays on a small scale, this is just the right one for you. For a bass guitar in its price, it comes with 6 strings. 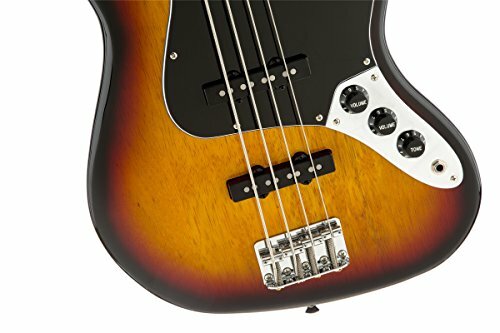 Though this may not be the best option if you are looking for a beginner bass guitar, it is the best choice for any advanced guitarist wanting to step up his/her skills. It will give you a good balance in tone and in addition to this; you will have more emphasis on the low-mid tones. The fact that it has got an adjustable bridge allows you to adjust your bass as you desire. It’s a 6-stringed guitar hence it gives you a more detailed sound. The adjustable bridge allows you to play a variety of tunes. Single-coil pick up for a more detailed sound. Q: is it right handed or left handed? Q: does it come with strings? A: yes, it is fully strung. Think of how awesome it would be if you could get a quality bass and at the same time spend less on a guitar. Well, if you're looking for a budget guitar but don’t want to compromise with the quality, this one's for you. The maple neck design makes things easier. It will surely allow you to play faster and at the same time, it is quite easy to play. The 22-fret count is one of the best when it comes to playing the bass notes with an electric guitar. The best bass is always in the lower fret numbers. As for the pickups, the guitar comes with the dean ‘soap bar’ style. This will give you both smooth low-end as well as an aggressive high-end. This is made of mahogany. With the vintage-style Dean Bridge, you will have things set up perfectly on the intonation front. The Dean Die cast tuners allow you to stay in tune all the time. It has 4 strings. With the 4 strings on your guitar, you get to have a narrower neck which automatically makes using it more comfortable and much easier. Also, the 4 strings are the easiest to master and perfect hence ideal for beginners. Single-coil pick up for a better sound quality. Has a basswood body construction for better sound and added durability. Despite playing very well, the finish is not that appealing. Q: does it have a case or a gig bag? 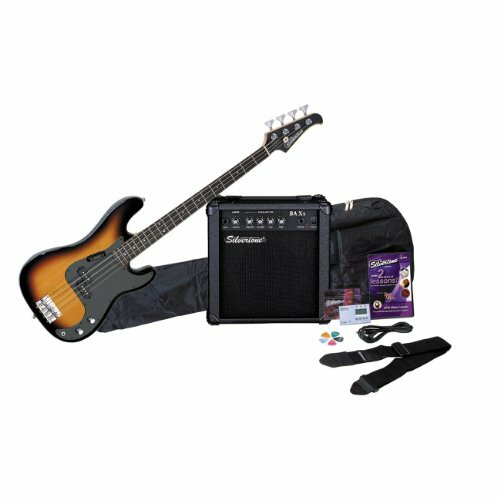 Q: is this a good beginner bass guitar? Q: do I get an amp with the guitar? 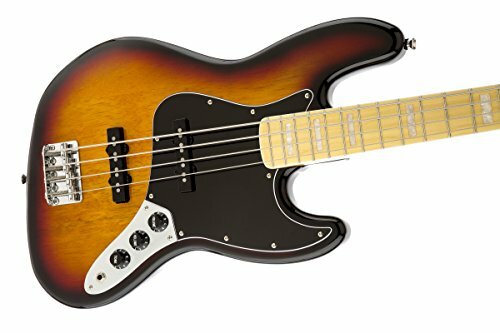 If you are looking for the ideal bass guitar for beginners as well as the advanced guitarists, then you should definitely check this one out. This crescent premium electric bass guitar is the best handmade bass guitar under $200. For a handmade guitar, however, it is equipped with lots of great features. With a basswood body, this can just be the best option if you are trying the guitar for the first time since it has got a short sustain. In addition to this, the guitar can be used for more complicated sounds. If you’re not really sure the kind of music you’ll be focusing on, be sure to try out this guitar. It has twenty frets. Rosewood fretboard and basswood body make it a durable guitar to play on your next rock performance. The maple neck is another good thing about the product. Right out of the box, the guitar comes with a tuner, extra strings, the picks as well as a strap and a gig bag. Considering that the guitar is entirely handmade, it packs quite a lot of gear for you. Summing up, considering that this guitar is 100% handmade; you surely cannot get a better deal if you are on a specific budget. It is 4-stringed hence easy to learn and perfect. Comes with a lot of accessories that make things simpler for any first timer. You may find the neck a little bit uncomfortable. Q: does it come with a strap, cord and picks? Q: will it work with a guitar amp? Q: does the guitar come with a case? The fact that it comes with 4 strings means that it will be narrower. One of the best-fretted guitars you can get for your money. The fret design has been around for long and this is so because of its simplicity. With the frets dividing the fingerboard, you'll get to see the position to play each note on the neck. Definitely, makes guitar playing much easier. Warm resonance, comfortable balance and fat tones, that’s the guitar offer to you. Since most of the bass playing takes place in the lower fret number, this guitar comes with 20 frets which will do just fine. To make things easier and much better for everyone, the guitar includes a BAXs bass amp, a digital tuner, an instructional DVD, strings, straps, picks, a cable and a gig bag. This is quite the deal for a bass guitar under 500 and surely will give you a good head start when it comes to using the bass guitars. As the body designed with laminated wood hence you get a better sound and a durable guitar. Q: can I use headphones with it? Q: is the guitar a full size? Q: is it a right-handed or a left-handed guitar? How Should You Choose a Bass Guitar? For anyone who’s familiar with the bass guitars, this may just be the hardest thing to do before you buy one. Here are some of the things you should have in mind before you buy one. Why would you like to get one? The purpose that why you need to get a guitar should be one of the key things to consider. Taking a simple scenario, the bass guitar needed by a beginner but not the choice that an expert will go for. It is important to know why you really need it, if you just want to get one for fun, you should go for the basic guitar. On the other hand, if you want more than just basic use and you need a better and more punchy bass, then you can spend more on your guitar. All things considered, this happens to be the most important factor when shopping for one. The bass guitar is a musical instrument that is used in most of the modern music styles. The low-end guitars are normally for the beginners who may love to learn of the bass that simple, fun and straightforward to learn. These guitars will come with both different quality electronics as well as hardware, which make them cheaper. As for the experienced and more dedicated guitarists who’d love to set their standards higher, the high-end guitars are the ones to go for. These come with a better electronic system and the top-notch hardware; the same also goes for the tonewoods. Besides sounding better to the ear, a high-end bass guitar will serve you longer and of course, you will feel better. Which fretboard layout do you prefer? These are normally of two types; the fretted and the fretless. The former is the normal guitar neck that we are used to; each fret divides each of the half steps on the chromatic scale. With this, it is easier to get the correct notes which make it ideal for a beginner. The fretless comes with smooth wood as you would get on an upright bass or violin. Though many assume this may be the best to use, but the sound quality entirely depends on your finger position. This is why the skilled players depend on the memory of their muscles for perfect positioning of their hands. Nevertheless, the more you practice, the better you’ll get. When it comes to the design, different guitarists have their own preferences as to which is best between the bolt-on and the neck-through type. The bolt-on neck design is the most common. These types of guitars come with the design that has the neck as a separate piece of wood attached to its body. As for the neck-through design, the guitar is of uniform span all through. These designs have got better durability, quality as well as the transfer of energy since they are made of many pieces of wood glued together. The bass tone it will give you. Well, it’s a bass guitar hence the bass tone should definitely not be overlooked. When it comes to the tone, the type of wood used in constructing the guitar is important. Though new players do not necessarily need to be concerned with the specifics, the body is quite an important factor when you want to get a particular sound for your guitar. Buyers Guide: How to Buy a Bass Guitar? Picking from the huge variety of bass guitars available in the market can be a daunting task for any beginning bass guitar player. There are many factors that you need to take into account first, before making your first purchase. It is important that you spend some time to look at every factor carefully so you will be happy with the guitar you buy. The first thing you need to look for when buying your bass guitar is the number of strings it has. A bass guitar can come with four, five, or six strings. The four string bass is the one that you may see most often and it is the easiest one for beginners to learn. The five or six string bass is for players who like to play around with different musical styles or perform a lot of solos. For a beginning bass player, I would recommend that you may start with the four string bass. The next thing that you need to consider is whether the bass guitar has frets or not. Having bass guitar with frets makes it quite easier to play and one will be able to produce a more consistent tone. The advantage of going with a fretless bass is that it will produce a more unique sound. It is also best to produce the vibrato effect that you hear often in the popular musical styles like Funk and Jazz. As a beginner, you can start out with a bass with frets. 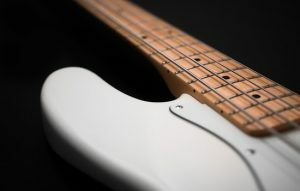 Finally, the last but not the least, you need to consider the price of the guitar when purchasing a bass guitar. Before setting your foot in the store, you need to set a budget in your mind for how much you want to spend. As a beginner, you will probably want to take a look at the entry level models. You can pick up one that sounds quite nice for under $500. If you are still uncertain whether you want to make it a full-time commitment to playing the bass, try to look for a cheaper model. A decent guitar can be had for around $200. Try not to be tempted by some shiny, more expensive models as they are beyond your skill level at this point may be. You can always buy something more advanced and high quality when you get better in your bass guitar training. Being one of the cheapest woods you could get out there; it is very popular and recommended for beginners. It is bound to give you a fairly balanced tone while at the same time paying attention to the low-mid notes which give it an amazing sound. Though there are different species used, there is very little difference between them all. Just like alder, you’ll get a beautifully bright sound. Desired because of its aesthetics is the swamp ash wood. If you want utmost clarity and a balanced tone, then alder is your choice. It is also the most commonly used for guitar bodies. If you want to get the most out of your guitar, this is definitely your choice. Giving you a warm, soft tone, mahogany will create a longer sustenance and at the same time pay heed to the tones especially the lower and mid-range tones. This is the high-quality one that comes with a shiny finish. Creating a well-sustained sound like mahogany is maple. If you want a guitar for a studio setting, then this is definitely your choice since it will give both a clear and bright tone. Though it doesn’t resonate so much and some bass players think it gives a flat sound, it can be the best option for complicated techniques since the sustain is short. There also poplar construction that you can consider. The good bass guitar is the one that’ll make you a better guitarist. If you’re a beginner, it will make learning much easier and if you already know how to play, well, you’ll be more experienced. For simplicity, you can go for the 4-string guitar. Bass guitars are generally available in two different sizes and different shapes. Short scale and long scale bass guitars are two variations of it also. Long scale ones come with 34 to 35 inches length of the scales with the 36.5 to 37.5-inch winding length of the strings. The standard size is a 34-inch length of the scale. 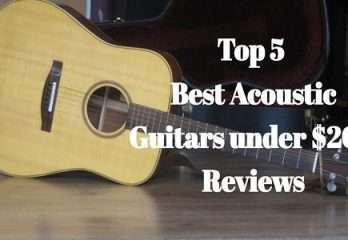 The best size of a guitar you select not just depends on its sound that you want to listen but also the playability and comfort level that you will get with it. Short scale guitars are best for the players with a shorter neck. These types of guitars also need a low level of string tension and it makes the guitar quite easy to play. Looking for the shape of the guitar does not decide the sound quality but it will help you to create a personality as a guitarist. A V shape bass guitar is a choice if you want to create a picture of a rock star. The size of your guitar is something that allows you to play your guitar comfortably and help you to get the sound that you want. If you have got tiny hands, go for the short scale guitar. Though the looks won’t make it sound better, they sure do matter to you; get a guitar that looks better and appeals to you. You should also choose a fretted one unless you’ve mastered it and want to scale higher. Before buying your first bass guitar, you need to make sure to consider each and every one of the factors above before settling on a specific model you want to buy. As you look at the various models, also make sure that the guitar feels comfortable to you personally as you test it out. Remember, you will be using this bass for a while, so you need to make that sure you are picking the best bass guitar in your budget for you. 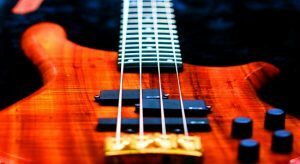 As much as a quick internet search for the best bass guitar will give you hundreds of feedbacks, this is not always the case and that is where we come in. … Consider this day your lucky day since in this section, I’ll be talking about some of the best bass guitars there are out there you can get for your money.